It’s that time of year again, football season! With the fall leaves comes our favorite past time, yelling at our closest friends about football. Every serious fantasy league needs an awesome prize for its winner. Short on fantasy football trophy ideas? Actual trophies are so old school, they sit on shelves and collect dust until next season. Your league needs something the winner can really gloat with. 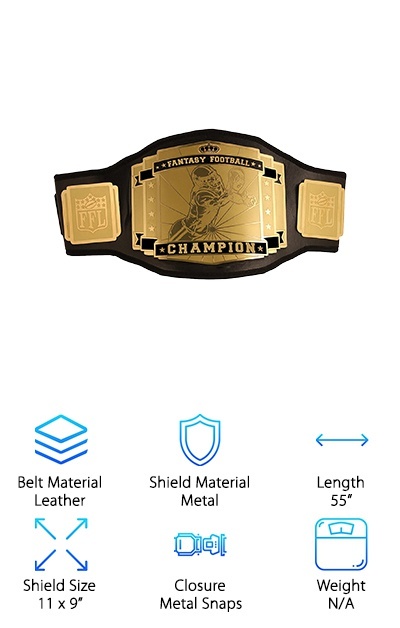 A fantasy football championship belt is a prize that everybody will remember! Belt Material - If you’re going to buy a belt for your league, you want it to look and feel like the real deal. Belts can come in everything from leather to fabric straps. Make sure you choose the material that is right for your league! Shield Material - Is this a belt you’ll keep for years to come? Or just something for a few good photos at the end of the season? If you’re looking for something long term, you’ll need a metal shield to engrave with all the winner’s names. Length - Is everyone in your league the same size? Probably not. Make sure to check that the belt you choose can fit everyone in your league, from the teenager that snuck in, to the guy who can’t stop sneaking snacks. Shield Size - Make a statement! Choosing a belt with a larger shield size can make for some great photo ops, but a smaller size is easier to wear to every post-season party. Larger shields can also mean more room for winner’s names. Closure - Belts close with everything from Velcro to metal snaps, so be sure to choose the closure that works best for you. Choosing a belt with multiple sizing options can also be a great way to ensure it fits everyone. Weight - Some belts can be as heavy as the weight of losing. Think about whether the winner of your league (AKA you) wants to wear your awesome belt or hang it on the wall. Then choose something in your weight class. Let’s get right to it! We know you need to get back to watching the waiver wire. We’ve assembled a buying guide that will help you navigate your way through the wide world of fantasy football trophy belts. Here’s our list of the best fantasy football belts on the market. If you’re trying to get back to watching your fantasy football rankings, just check out the first two - our top pick and our budget pick. Those are the players you scooped up in the first round and held on to all season. Let’s go! This awesome belt was the best fantasy football belt we reviewed and offer excellent value. It’s not too heavy, but definitely not a lightweight. You could show up to your next league BBQ wearing your winnings. At 55”, it’s sure to fit everyone in your league. Undisputed Belts says it should fit anywhere from a 30” all the way to a 50” waist. 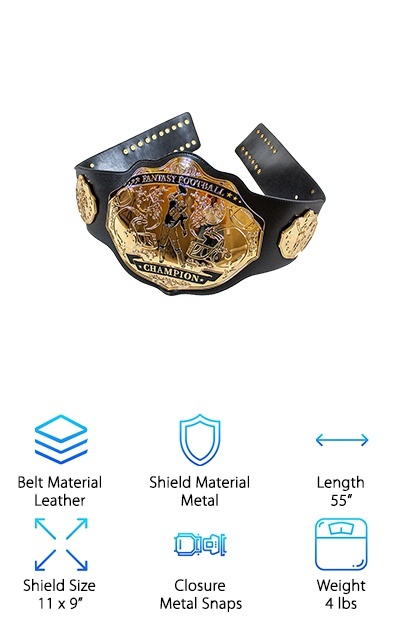 What really makes this belt a winner is the PU leather material used for the strap and the strong metal on the shield. The front plate loudly proclaims that you are the fantasy football champion, a true king among men. This belt also includes four metal plates on the sides of the main shield, which makes the whole belt feel official and cool. Those plates are about half the size of the main shield, no distractions from what it’s really about. It’s perfect for wearing all year until someone takes it all away from you. If you’re looking for the best bang for your buck, look no further than our budget pick made by Decade Awards. 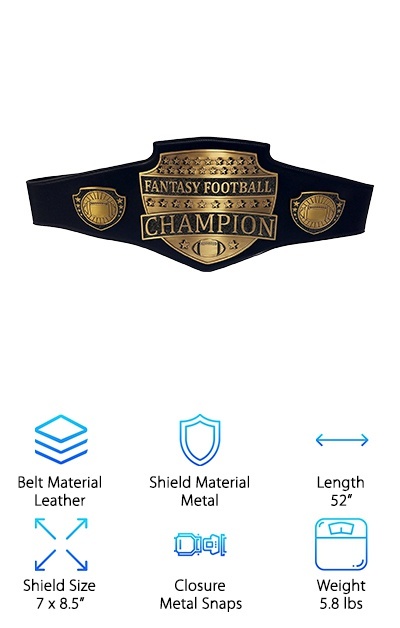 This incredible, cheap fantasy football championship belt has it all. It’s made of genuine leather and has all metal plates. It doesn’t look cheap either, with a gold finish and beautiful black color-fill enamel. It’s a little shorter than some other belts on this list, at about 52”, but this shouldn’t prevent most people in your league from wearing it. The plate is also smaller, but this belt is still among the heaviest we reviewed. The really awesome thing about this belt is that it comes with its own wall hanger and satin-lined box. Be sure to display your superiority over your fellow league-mates in your house or on the go. This belt includes two side plates, which are printed with footballs. This doesn’t leave much room for engraving the past winner’s names, but who cares about them anyway? You’re top dog now. 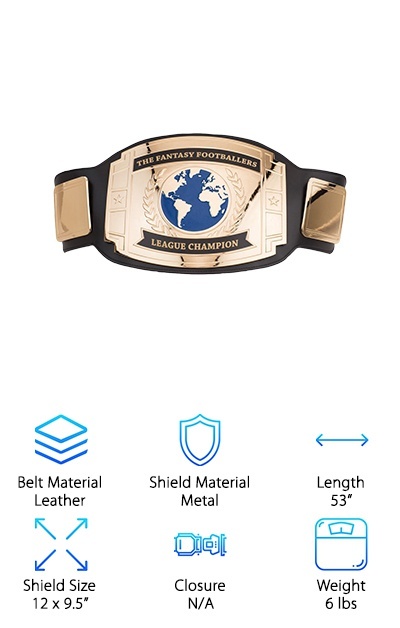 If you really want something unique for your league, try this custom fantasy football championship belt! It can be engraved on the top and bottom banners with any text you’d like. Put your team’s name, some smack talk, or anything else you want on this giant belt. The belt also includes two 4” metal side plates and two 3.5” metal end plates. These can be a perfect space to engrave the names of previous winners, their team names, and the year they went all the way. It really holds its weight, at 6lbs, this belt is not for the weak among us. The belt is sleek looking as well, a black leather band with shiny gold plates. The plates are embossed metal with enamel paint, and your text is laser engraved along the banners. If your league really likes this belt, you can always grab another for whatever you’re betting on in the offseason, from FIFA to hockey. 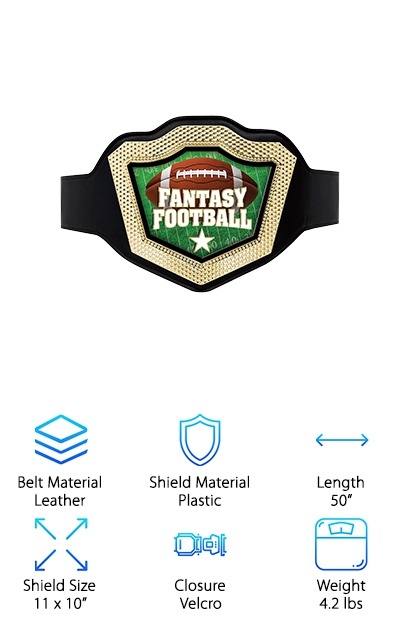 This fantasy football trophy belt is a great option if you’re looking for something with seriously cool graphics. The brushed gold finish on this bad boy looks really cool. It definitely says “champion.” The image on the front plate is of a player swooping in and getting that final touchdown, just like you swooped in and won the whole league. It even comes with a crown at the top of the main shield. 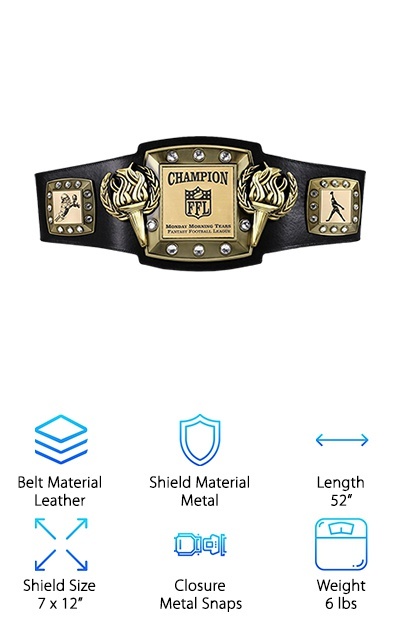 This belt also includes two side plates with a fantasy football icon and players doing their victory dances. All on high-quality metal plates. You’ll certainly be doing a victory dance when your friends have to admit defeat and hand you this awesome belt. The strap is made of leather, so it looks and feels great. This belt is not for losers, that’s for sure. It’s 55” in length, with multiple metal snaps, so it’s sure to fit you no matter how many victory cheeseburgers you eat. This belt really pops, with jeweled studs surrounding the face of the shield. 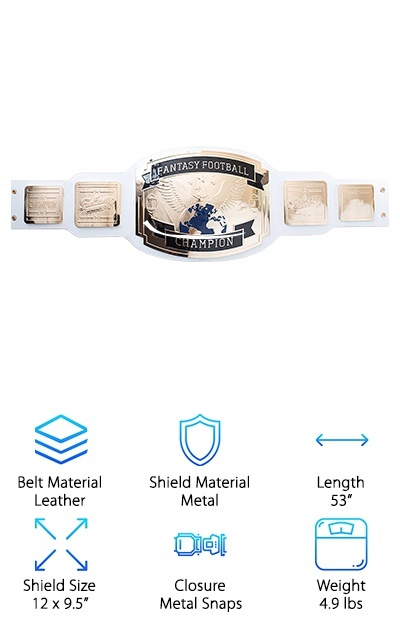 SLD is committed to creating a great belt for your fantasy football league, and this one is no exception. It’s highly customizable. You can choose between nine different fantasy football league logos for the two side plates. You can also customize the front plate with any text you want. This belt really pumps it up with the two victory torches that are on either side of the main plate. The unique thing about this belt is that all of the plates are able to be switched. Just contact SLD when you need a new plate made for this year's winner, and they’ll create a custom plate for you. The plates are easy to change out by yourself. This belt is also made of genuine leather, unlike some other fantasy belts. It comes with eight size adjustment straps, ensuring it will fit everyone in your league for years to come. If you’re not into the typical black and gold belts, this belt might be worth a look. It comes in four color combinations- black and gold, black and silver, white and gold, and white and silver. We’re big fans of the white and gold combination, it looks really sleek. So if your league is a little more into cool color combinations, this could be the perfect fantasy football title belt! The main buckle is covered in all things football, from helmets to footballs to players. The text is printed in a black enamel painted background. This belt also includes four side plates, two of which can be used for your own engravings. Feel free to engrave the winner’s name, the loser’s name, the league name, or anything else that needs to be written down for future players. 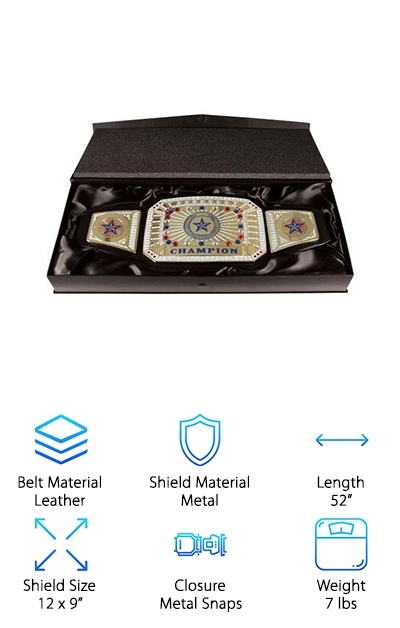 There’s no plastic on this belt so you can be sure that it is a high-quality prize. 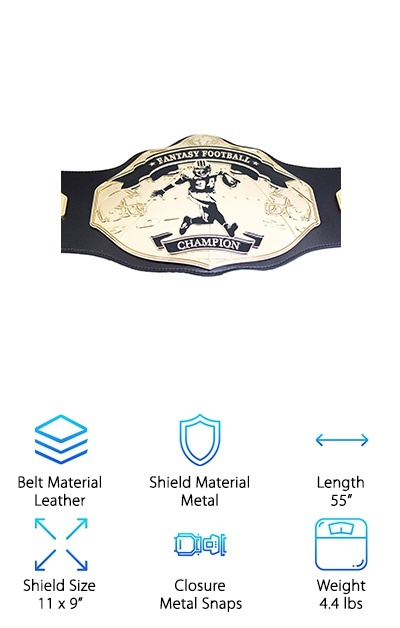 This belt makes sure you’re ready for some serious football! Another belt with some great color options, this fantasy football trophy is sure to be the envy of the whole league. If size is important to you, this is the belt for you. The largest shield on our list- at 12” x 9.5”, this is sure to be a showstopper when you walk into the bar. It’s heavy too- at around 4.9 lbs. It comes in three colors- white and gold, black and silver, and black and gold. It even comes with four side plates, two of which are perfect for engraving. It really looks like a heavyweight championship belt, for the heavyweight champion you are. A monumental belt, this one’s in it for the long haul. It can be used for years of fantasy football bragging. It’s a high-quality belt that many people have used season after season, with the changeable nameplate rotating with the winner. For everything from first downs to touchdowns, this belt is ready. Looking for something that works for everyone? This fantasy football belt is not only good looking, but it's also among the longest and lightest belts on our list. If you’re looking for something that’s a little more wearable and a little less heavy duty, this is a great choice. Weighing in at four pounds, it is light enough to wear comfortably. It isn’t so light though that you forget that you’re wearing a championship belt! It is made of high-quality materials, like leather and real metal. No plastic here! Its design is one of our favorites as well. The main shield shows a player scoring a touchdown, but it is painted in black enamel. This really makes the belt stand out. The football player is surrounded by footballs and stars, reminding you that this is a belt for a winner. It has four side plates, two of them are blank for engraving. The long belt strap means it will fit everyone in your league. Let’s get fancy! This belt stands out from the pack with its bright colors and gemstones. The bright red, white, and blues are a great tribute to football rings everywhere. It looks like a champion’s belt for sure. It comes with two different designs for the final belt, and you get both plates, so you can choose which one you like best! It proclaims “champion” loudly across the bottom. This belt also comes with its own satin presentation box. If you’re looking to really keep this baby safe, having its own box is a great way to ensure that. No more “oh, sorry dude I messed up the belt.” It’s one of the heaviest belts we reviewed, at 7 pounds. You’ll definitely feel the full weight of a win on your shoulders! 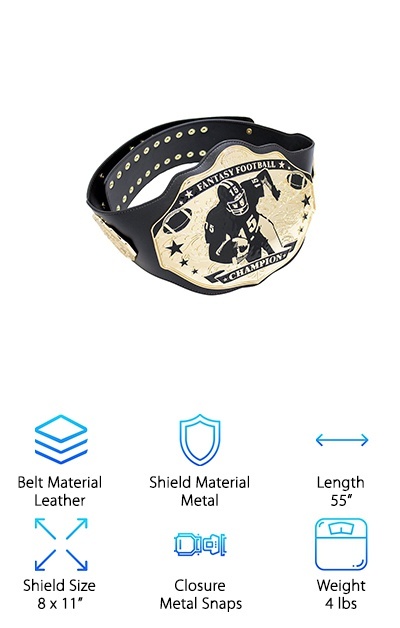 The belt comes with metal snaps to make sure it stays tightly on whoever gets to wear it. It is also genuine leather, so you’ll feel fancy too! This is truly a great pick if you’re just looking for something to take some photos with or brag with at parties. The Hero Shield Fantasy Football belt is made of leather but includes a Velcro strap instead of the typical metal snaps. This makes it easily adjustable and a more flexible choice for leagues with many different sized members. It is among the lighter belts, meaning you can all pass it around and try it out without dropping it too many times. That also means you can do your victory dance easily while wearing it. A luxe beveled design around the main shield makes it a great partner in all your photos. The shield design is bright and is sure to pop! If you’re looking for something simple, this is the belt for you. This belt is also great for leagues just starting up, who want to test the waters on a fantasy football belt before spending the big bucks.